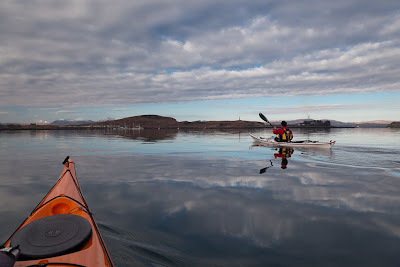 From Oban sea front round Kerrera, a 23km day paddle on the Firth of Lorn, February 2011. Crossing Oban Bay to Kerrera. Although we started in the town, most usually the best launches would be from Corran Esplanade or from Ganavan Sands. 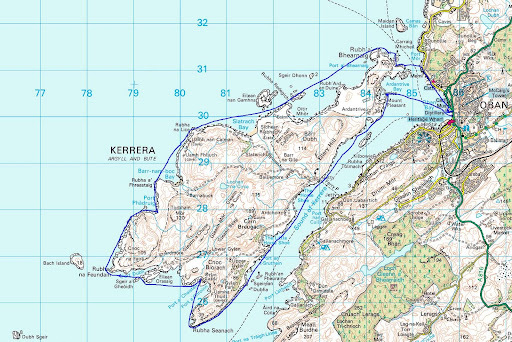 You can also launch over rocks north of the Kerrera ferry, opposite yacht moorings but not at the ferry itself. Sound of Kerrera the flood enters the south end and exits the north end by Oban. NE going flood begins +0430 HW Oban (-0100 HW Dover) 1 to 2.5 knots springs. SW going ebb begins -0155 HW Oban (+0500 HW Dover) 1 to 2.5 knots springs. In the channel between Bach Island and Kerrera. Times as above flow 2.5 knots springs. Wind against tide here can cause a nasty steep sea. Kerrera is usually seen as a beginner trip but even in the calm conditions of this trip we were unable to land on the south coast due to swell. I have never been able to land at Gylen Castle. Max, the parrot vampire of Kerrera! Wot a Loti toing and froing in Oban harbour.